No time for class, or going out of town? ReidSan will care for, and train your dog at our lush ReidSan Kennel In The Grove. Just think, Reidsan gives your dog professional training, exercise, and personal attention. Turn boarding time into training time. 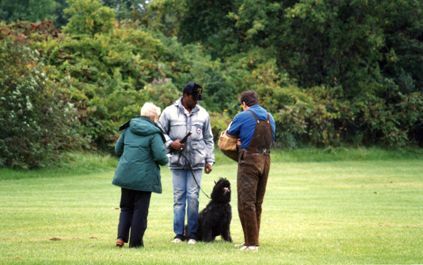 Training Outline: Heel, Sit, Down, Come, Stay, Finish to Heel, Correcting Behavior Problems, AKC Hand Signals. Upon completion, training sessions are given to owner. Out of El Paso Area? Shipping arrangements can be made for your dog. All Dogs must be current on annual shots to include; Kennel Cough vaccine, and Flea-Tick control. (Collar or frontline type product).